274 pages | 23 B/W Illus. 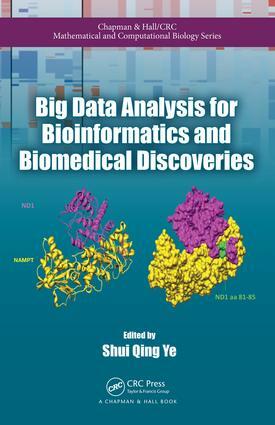 Big Data Analysis for Bioinformatics and Biomedical Discoveries provides a practical guide to the nuts and bolts of Big Data, enabling you to quickly and effectively harness the power of Big Data to make groundbreaking biological discoveries, carry out translational medical research, and implement personalized genomic medicine. Contributing to the NIH Big Data to Knowledge (BD2K) initiative, the book enhances your computational and quantitative skills so that you can exploit the Big Data being generated in the current omics era. The book explores many significant topics of Big Data analyses in an easily understandable format. It describes popular tools and software for Big Data analyses and explains next-generation DNA sequencing data analyses. It also discusses comprehensive Big Data analyses of several major areas, including the integration of omics data, pharmacogenomics, electronic health record data, and drug discovery. Accessible to biologists, biomedical scientists, bioinformaticians, and computer data analysts, the book keeps complex mathematical deductions and jargon to a minimum. Each chapter includes a theoretical introduction, example applications, data analysis principles, step-by-step tutorials, and authoritative references. Shui Qing Ye, MD, PhD, is the William R. Brown/Missouri Endowed Chair in Medical Genetics and Molecular Medicine and a tenured full professor in biomedical and health informatics and pediatrics at the University of Missouri–Kansas City School of Medicine. He is also the director of the Division of Experimental and Translational Genetics in the Department of Pediatrics and director of the Core of Omics Research at The Children’s Mercy Hospital. Dr. Ye has been involved with biomedical research for more than 30 years. His current research interests include the application of translational bioinformatics to leverage Big Data to make biological discoveries and gain new, unifying global biological insights, which may lead to the development of new diagnostic and therapeutic targets for human diseases.